Nene Valley Harrier Cat Foley-Wray lapped up the plaudits after a fantastic run in the South of England Cross-Country Championship at Parliament Hill Fields in London on Saturday. The 29 year-old took on many of the best cross-country runners that the Southern counties have to offer and finished in an excellent ninth position, even leading the field in the early stages as she raced up the iconic hill taking the runners onto Hampstead Heath. Flo Brill in action in London. The Stamford-based off-road ace knew that a fast start was essential as the course narrows on the hill and this can lead to congestion. Despite slipping back a few places on the first of the two laps, Foley-Wray went through halfway in ninth place, and comfortably held on to that position as she ploughed her way through some of the muddiest conditions ever seen on the course, completing the 8km distance in an impressive time of 31:43. The two other Nene Valley ladies who made the journey to North London also ran well, with Grace Mullins finishing in an excellent 38th position, capitalising on fine form that saw her take the silver medal in the Lincolnshire Championships earlier this year, behind gold medalist Foley-Wray. Nicky Morgan crossed the line just outside the top 100 in a 500-strong field. Josephine Fortune of Nene ValleyHarriers. Morgan has already won the North Midlands Veterans title this season, but this was perhaps her finest run of the winter as she was racing athletes of all ages from 20 upwards. With team-mates Foley-Wray and Mullins certain to be asked to represent Lincolnshire in next months Inter-Counties Championships, the Hampton-based speedster will hope to join them as she should have impressed the Cambridgeshire selectors with her fine performance. Peterborough AC’s Sarah Caskey ran strongly, also finishing just outside the top 100. It wasn’t only the Nene Valley seniors who impressed though as Cambridgeshire county champion Flo Brill finished 10th out of over 250 girls in the Under 13 girls race while her team-mate Katie Tasker took 65th place. L ong-striding Alex Hampson finished 28th in the Under 20 men’s race, in what is his first of three years completing in the age group. Jevan Robertson and Bradley Spurden also ran well taking 48th and 56th positions. Other Harrier’s highlights were Samuel Oakley’s 96th place in the boys Under 13 age-group, eight places ahead of his Peterborough AC rival Harvey Hancock, and Megan Ellison’s 73rd position in the girls Under 17 race, seven positions ahead of Olivia Ozkan. Ollie Bowling was the 71st Under 17 boy while Josephine Fortune and Amber Park finished 54th and 69th respectively in the Under 15 category. The senior men fought valiantly with Mike Chapman the first Nene Valley athlete home in 355th position. 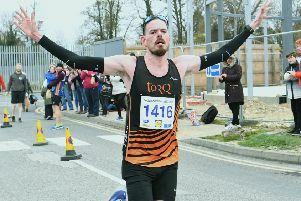 James McDonald, Lee Harthill and Ollie Slater were the three other Harriers to make it into the top 500 along with Werrington Jogger Jeff Lucas. Yvonne Scarrott enjoyed a fine start to her 2016 racing season as she took the female Over 45 vets prize at the Freethorpe 10 mile road race in Norfolk on Sunday. The 49 year old Nene Valley Harrier finished as fourth lady overall in a time of 68:43, her quickest outing over the distance for six years.